At-home preserving is ridiculously trendy. Preserving food at home has become modish of late. 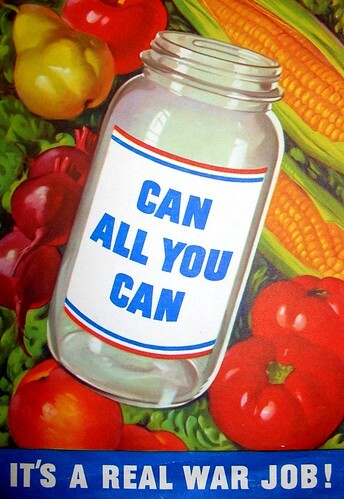 The Wall Street Journal, NPR, and the New York Times have all noted the intense popularity of canning: overflowing classes, new cookbooks, obsessive blogs, and Twitter-publicized can-ins. Another, more concrete indication of the trend: sales of the Jarden Corporation’s Ball glass canning jars are booming despite the recession. Its 2010 sales are up nearly 10 percent, and that’s after a 2009 increase of 30 percent over 2008. It’s cute that a practice once associated with grandmothers, 4-H-ers, zealous gardeners with too many cucumbers, and the occasional survivalist, is now a litmus test for gourmandism. But there’s a revivalist fervor bottled up in those jars—enthusiasts tout the thriftiness, healthfulness, and environmental virtues of marmalades and dilly beans—that seems overwrought. As with many food trends, today’s cultish hobby was yesterday’s necessity. In an effort to combat food spoilage in the early 19th century, long before the advent refrigeration, French jam-maker Nicolas Appert systematized the process of hermetically sealing food in jars and sterilizing them. This concept quickly made its way into the United States, and by the turn of the century canning was a common household practice. During both World Wars, government education programs encouraged home consumers to grow their own food in “Victory Gardens” and to preserve it themselves. These programs taught that at- home preserving could reduce food waste and thus ensure the supply of key commercial crops for soldiers. It was in the 1970s that home preserving first took on an oppositional message—it was part of that era’s homespun chic. If back-to-the-landers tried to exit the commercial food economy altogether by canning their homegrown crops, dabblers could at least put up a few jars of homemade chutney to serve as a tasty, handcrafted no-thank-you to Smuckers. But this fondness for handmade preserves didn’t stick around. The anti-corporate-food revolution softened its edge and quickly became indistinguishable from the specialty food industry. Au courant pantries featured jars of preserved food from faraway lands (Italian cherries, say), not one’s own backyard. Beyond money, canning demands an investment of labor and organization. In any volume, it can be serious drudgery. My mother, whose family substantially augmented their diet with food grown in their Maryland garden, does not fondly remember her days of putting up vast volumes of green beans, peaches, and tomatoes with my grandmother—though she does admit that the results were very tasty. Furthermore, only select foods are easy to can. Botulism thrives in low-acid environments, so if you’re looking to safely process beans and soups and other low-acid foods—on which you could actually base your diet—you get into the tricky business of pressure canning or the less nostalgic, less photogenic, but much simpler, alternative: freezing. If you’re not a die-hard, you’ll likely only can high-sugar, high-acid foods like jellies, jams, chutneys, or pickles—in other words, condiments.